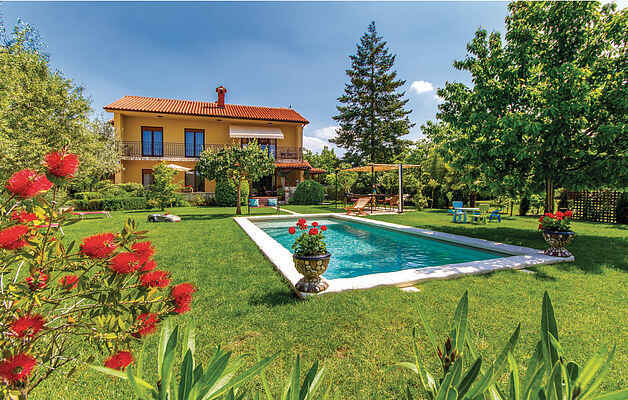 This beautiful holiday house is located in the village Marčana, near Pula. It consists of two separate apartments which are connected via external stairs. In addition to the comfortable interiors, this domicile also has a large terrace with barbecue, where you can prepare delicious meals. The well-kept garden with a pool and Mediterranean plants invites for sunbathing while your children can play undisturbed. The nearest beaches are located in Duga Uvala. Visit the nearby places such as Pula, Fažana, Medulin, Cape Kamenja and the romantic town of Rovinj.